For eCommerce, Pinterest can be a game-changer! Especially if you’re targeting millennials or a female audience. Statistics show that 1 in every 2 millennials in the US is using Pinterest, and a whopping 45% of all females on the internet do have a Pinterest account. Yup, you read that right, it’s nearly half the females on the world wide web. Other audiences are hanging there too, and the numbers are significant, but the previous two are the majority. So, If you’re targeting females or millennials, then Pinterest can be the strongest asset in your digital marketing strategy. In today’s blog post we’re bringing you a few tips that can help your business leverage the amazing benefits that come with being on Pinterest. 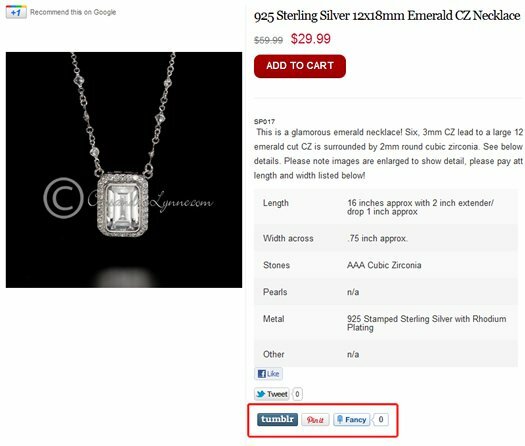 Adding this button will encourage your customers to pin their favorite products directly to their Pinterest boards. This gives your brand free exposure to the people who follow them on the platform. This is how a “pin it” button looks like on a product page on your website. You can create boards from your brand’s Pinterest account and share them on the website through Pinterest website plugins. These boards can be different collections of your products that your customer can use as inspiration. An example of this can be a board for “Mother’s day gift ideas” or if your eCommerce sells clothes it can be suggestions on different looks that they can try with your clothing. The platform enabled shoppable pins on various eCommerce platforms (including Shopify). So if your online store is on one of these platforms you can enable the shoppable pins features and start putting your products in front of thousands of new customers. Statistics on Hootsuite shows that 55% of users shop on the site itself, which is basically 4 times the percentage of other digital platforms. It’s like opening a new digital storefront. Pinterest is a great platform when it comes to content marketing. It has a really high sharing potential since users pin and repin things all the time. That’s why creating and promoting valuable content, not only products, on Pinterest can be a game-changer for your Pinterest marketing. Valuable and entertaining content doesn’t only position your brand as an expert in its domain, but it also drives more traffic, conversion and customer loyalty. But make sure that while creating content for Pinterest, you need to keep in mind that it's all about visuals, that’s why Infographics enjoy the lion’s share on the platform. The type of content you create highly depends on the type of your business and what you want to get out of your Pinterest marketing. That’s why it’s highly advisable to work with a content marketing expert to choose the type of content that matches your current business goals. If you think your target audience might be hanging out on Pinterest, then it’s time to give it a shot. And if you’re already on Pinterest, we would love to hear your opinion about it, was it a good choice? Tell us on LinkedIn, Facebook, Twitter or Instagram. Did you find this info helpful? Share it! Receive critical Shopify updates, free tips related to your business, and exclusive offers reserved for subscribers only directly in your inbox. Bespark sends only highly relevant emails. No spam. Promise. BeSpark – Shopify development studio.